The Peabody Awards, an organization out of the University of Georgia, hosts an award show that gives the highest honor to journalists and broadcast media. 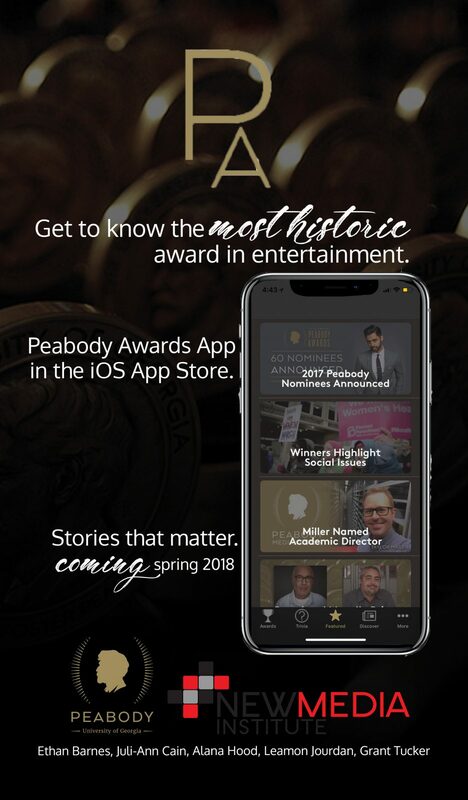 Our app will feature a condensed archive of the latest videos from Peabody award shows, news on the awards, an archive of historical recordings, a trivia game, and information on the awards themselves. From media enthusiasts to scholars, the app will appeal to anyone interested in entertainment. The essence of our project was the design, construction, and implementation of a mobile app for the Peabody Awards. It has been said that “You count your Emmys, but you cherish your Peabodys,” but no matter how you say it, the Peabodys are the most prestigious recognition of excellence in broadcasting, new media, and the telling of “stories that matter.” Our goal was to help facilitate this recognition by creating a home for the Peabodys right on your mobile device. The app will provide casual fans, dedicated scholars, and all those in between, a unique way to keep up with the latest updates, access the wealth of digitized content, test your knowledge with trivia, and view all the winners. The app is intuitively structured to invite the user to explore and discover all that these historic awards have to offer. Download now!